Elaborately detailed brass serpents coil around bright red opaque glass cabochons. The serpent, representing eternal love, was a popular design motif from the victorian era onward. Exquisitely crafted and in Extremely Fine condition. Item # 10766 Price: $325 USD Tell me more! Item #10226 Price: SOLD Tell me more! Flowers that never wilt! This imaginative floral art glass creation in soft pastel shades of pink and turquoise will brighten up the dreariest winter day and put a little spring in your step. There are seven flower clusters on this necklace that graduate from two pink flowers each to the three clusters in the center that have four pink flowers each. Item # 10055 Price:$245 USD Tell me more! 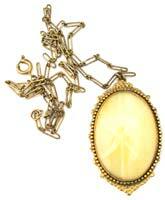 From the Art Deco era, a unique pendant created from brass and set with a large piece of yellow glass cut en cabochon. The glass has been created to simulate a star sapphire with the points of the star extending to the edges of the stone. Item # 10738 Price: $175 USD Tell me more! 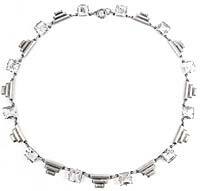 Classic Art Deco styling in crystal and silver. The silver settings for the faceted clear crystal pieces are intricately detailed on the backs. The glass has been prong set. Between the sparkling crystals are silver spacers created in the stepped design so popular during the 1920s. Reminiscent of skyscrapers. Extremely Fine condition with no damage to crystal or silver. Item # 10714 Price: $375 USD Tell me more! Item #10806 Price: SOLD Tell me more! Fabulous topaz glass!! This lovely 1930's creation features five rounded triangular pieces of prong set topaz glass that are faceted on the back not the front which creates an unusual effect. The settings are open on the back to allow light to shine through. 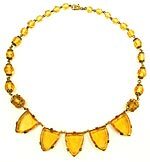 On either side of these are faceted amber glass beads that graduate in size from 10mm to 6mm. The two largest beads on either side of the triangular pieces of glass are capped on each end with gold over brass filigree. Item # 10011 Price:$100 USD Tell me more! 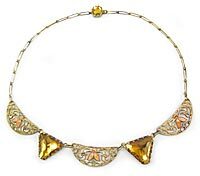 A delightful creation comprised of gold washed brass filigree inlaid with enamel and faceted amber glass. The glass stones are foil backed which really adds to their sparkle. The two faceted stones are prong set in closed back brass settings. The enamel that ornaments the brass filigree spacers between the glass stones, is of a peach color. Very Good condition overall. Item #10778 Price: SOLD Tell me more! A beautiful Victorian buckle bracelet created from brass that has been lavishly engraved with flowers and vines. The band has two holes for size adjustment. The band is 3/4 inch wide. The buckle is 1-3/8 inches by 1 inch wide. It will fit a 7-1/2 inch wrist maximum. Can be adjusted down to 7 inches. Extremely Fine condition with no damage or repairs. Item # 10816 Price: $95 USD Tell me more!